The last few privately taken photos of an American president before his death were in an old Japanese lady’s photo album. These four photos had intrigued me. They had caught my eye earlier but there were other precious photographs to scan and retouch. But the curiosity killed this old sourpuss. I had to scan them… and there were fantastic discoveries. 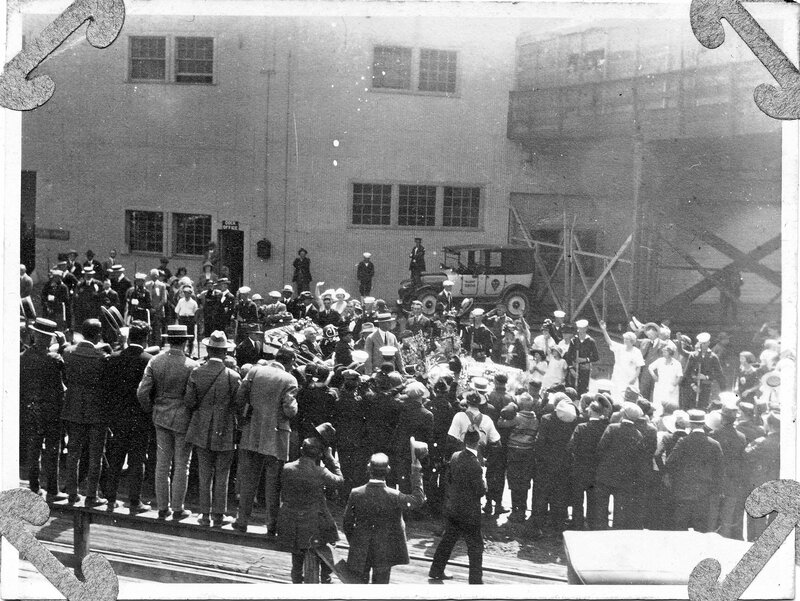 President Harding, our 29th president, arrived in Seattle on July 27, 1923. He was on a 40-day tour of the Western United States. He would pass away just six days later. 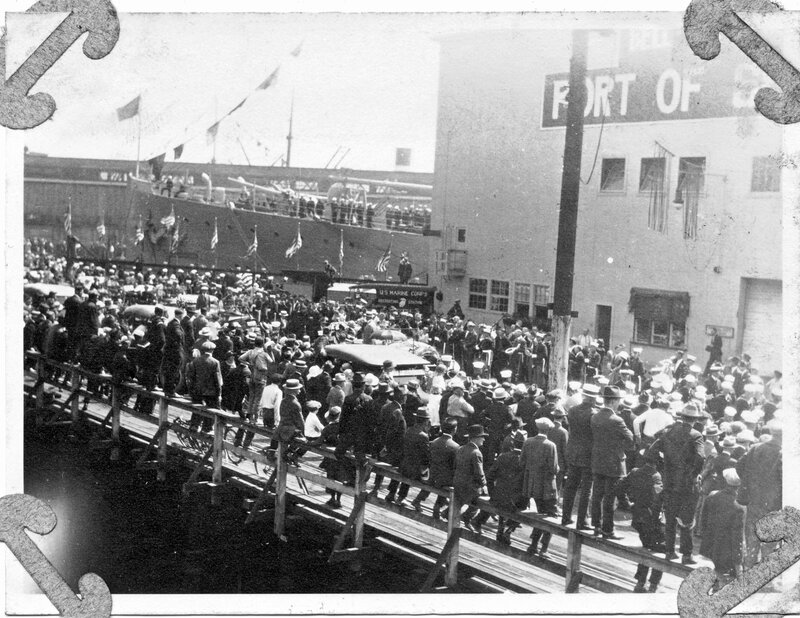 After collaborating with a flickr buddy and author, Shawn Hennessey, we came to the conclusion that this indeed was President Harding’s motorcade at the Port of Seattle. Of course, we will never know for sure who took these photos but they are of the same size and finish of many of Grandmother Kono’s other photos of that time period. Still, they are remarkably an incredible capture historically. They are unretouched. I thought they look better as-is. A shuttle bears the colors and a civilian stands at the aft. US Navy sailors are at the fore. 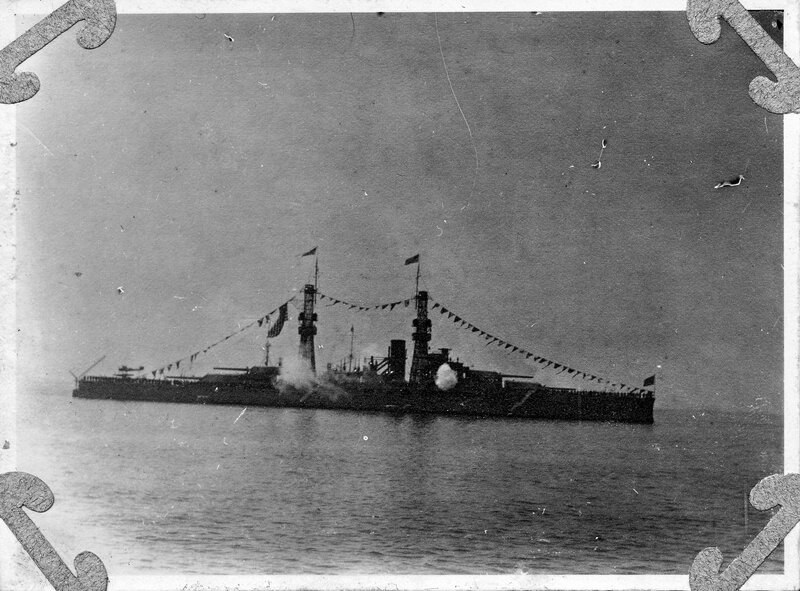 Shawn Hennessy believes this to be a Pennsylvania class battleship due to the single stack. President Harding did review the fleet in the harbor (about 50 ships). You can clearly make out the Port of Seattle signage with the beginning of “Bell Street Pier” on the building. Note the US Marine and US Navy color guards. 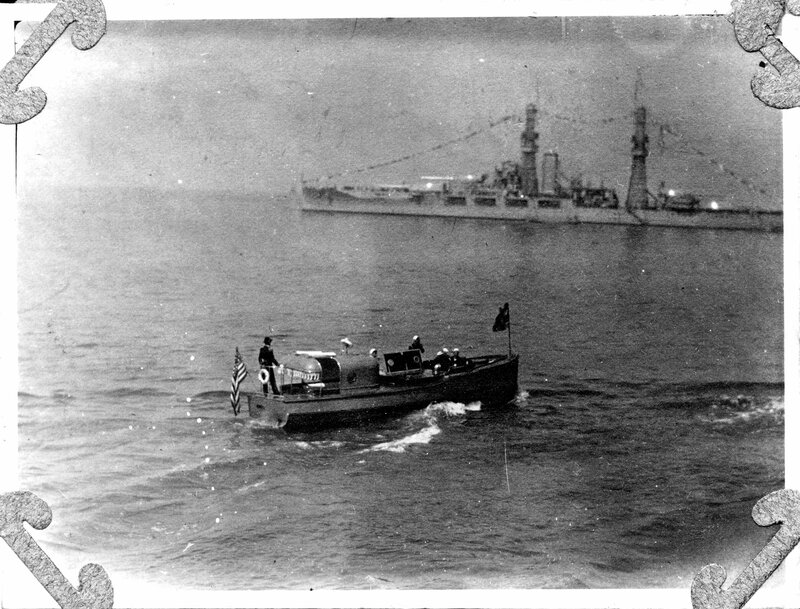 It is likely President Harding’s destroyer that is docked at pier’s end. The blanket of flowers can be seen on the hood of the President’s limousine, too. The President can be seen closer below. Of note is the agent standing on the limousine’s running board – or more specifically, his clothing. Compare his clothing to other images you can find on the web. You will see gentlemen doffing their hats to the President as he passes by. President Harding. He will pass away six days later in San Francisco. Just a glimpse into American history – from a Hiroshima photo album. 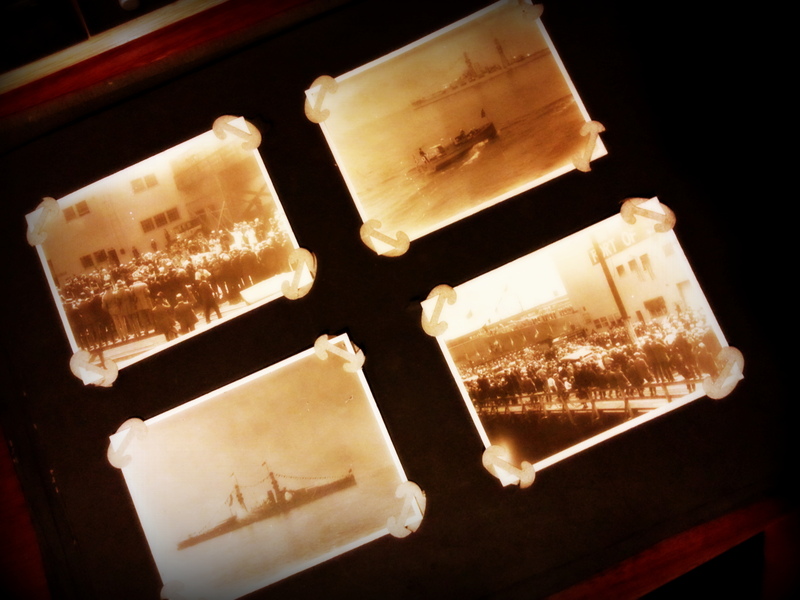 I hope you all won’t mind if I feel Grandmother Kono took these pictures in 1923. It was indeed surprising to not only have them but to research their history. President Harding was apparently already ill before disembarking at the pier. How fragile life was. I don’t mind at all!!!! Fabulous Mustang.Koji!!!!!!! You are full of all kinds of great surprises. And from the photographs your family has saved over the years, you seem to share of love for this with other family members. How exciting to figure this out! 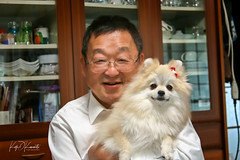 Koji, these photos need to go into the Library of Congress photographs collection. They are important historical events! And how would that be accomplished? 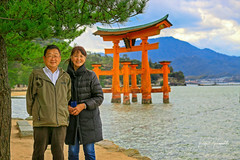 They aren’t earth-shattering photos but considering my grandmother’s future, I did feel these photos to be amazing…that she would take them back to Hiroshima with her. your grandmother has passed on a wonderful legacy to your family in pictures. What a treasure you have there, especially since it was so close to his death. Your photo album is PRECIOUS. My uncle was one of the marines there. What a coincidence! Did he have any photos?! his time in the marines. He died of TB in the thirties. I’m sorry to learn of your Marine uncle passing away from TB… Best of luck in your research efforts!